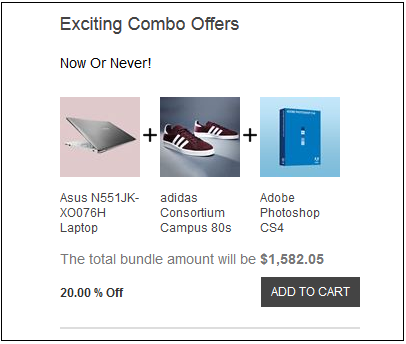 As you see in below image you can add bundle to the cart by clicking on ADD TO CART bundle below your choice of bundle. You can add multiple or same bundles to the cart more than once. When you click on ADD TO CART button and if any of your products linked with the bundle has any configurable property(attribute) to be selected, a pop-up window will appear asking you to select attributes of your choice. You can view the discounts applied on the cart as well as on order summary pages. If you still cannot view your bundles list on product details page, you can get help from our team. Please refer How to get help.